The grapefruit is not to be confused with grape. Its pulp segments are pungent, tart either pallid or red and shell out easily. The fruit is highly prized in Asia, growing less today. I remember as my father also did that we used to play football with Batabi lebu due to overproduced fruit crops in my childhood days. 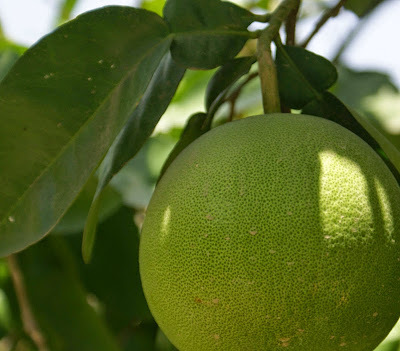 After cutting and pulling the rind, separating the segments inside the fruit membrane, the giant lemonish fruity flesh is available to eat raw, salad, candied or as fruit juice. Its peel, which serves as a vessel for several core culinary preparations. The fruit bears multiple seeds, which is used to make essential oil. Take juice, sugarcane juice ice cubes, rock salt, chili and honey in a shaker. Shake well. 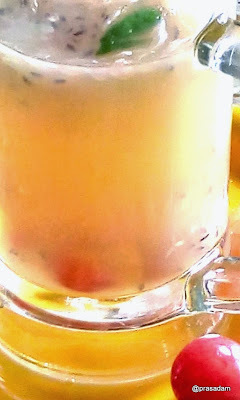 Take a tall glass, add grapes, one or two cubes, some grapefruit flesh, then add juice punch. Enjoy the traditional refreshing drink in a healthy way. Grapefruit/Pummelo is a staple fruit in Vietnamese food culture and cuisine. Grapefruit is customarily a breakfast fruit, chilled, cut in half, the sections loosened from the peel and each other by a special curved knife, and the pulp spooned from the "half-shell". Some consumers sweeten it with white or brown sugar, or a bit of honey. Some add cinnamon, nutmeg or cloves. As an appetizer before dinner, grapefruit halves may be similarly sweetened, lightly broiled, and served hot, often topped with a maraschino cherry. The sections are commonly used in fruit cups or fruit salads, in gelatins or puddings and tarts. They are commercially canned in sirup. In Australia, grapefruit is commercially processed as marmalade. It may also be made into jelly. The juice is marketed as a beverage fresh, canned, or dehydrated as powder, or concentrated and frozen. It can be made into an excellent vinegar or carefully fermented as wine. Grapefruit peel is candied and is an important source of pectin for the preservation of other fruits. The peel oil, expressed or distilled, is commonly employed in soft-drink flavoring, after the removal of 50% of the monoterpenes. The main ingredient in the outer peel oil is nookatone. Extracted nookatone, added to grapefruit juice powder, enhances the flavor of the reconstituted juice. Naringin, extracted from the inner peel [albedo], is used as a bitter in "tonic" beverages, bitter chocolate, ice cream and ices. It is chemically converted into a sweetener about 1,500 times sweeter than sugar. After the extraction of naringin, the albedo can be reprocessed to recover pectin. Grapefruit seed oil is dark and exceedingly bitter but, bleached and refined, it is pale-yellow, bland, much like olive oil in flavor, and can be used similarly. Because it is an unsaturated fat, its production has greatly increased since 1960. "Citrus maxima [Burm.] Merrill; C grandis [L.] Osbeck; Shaddock; Pummelo"
There are some Indian names of the fruit. In Hindi: Chakotra, mahanibu, sadaphal, in Gujrati Obakotru, In Marathi the fruit is called papnasa Malayalam Pamparamasam, Tamil Periya elumuchhai/Pambalimasu, and Telegu Pampalamasam. Traditionally the fruit is used for developing resistance against colds and influenza. Grapefruit is rich in vitamins, minerals, potassiumand pectin, which balance the acid reaction in the stomach and stimulate appetite. Leaves, flowers and rinds are used as a sedative in nervous affections and also used in convulsive cough, chorea, epilepsy, also in the treatment of haemorrhagic diseases. A lotion of boiled leaves used hot in painful swellings. The essential oil from the leaves and unripe fruits contain 20% limonin, 30% nerolol, 40% nerolyl acetate and 3% geraniol. The Fruit is antiscorbutic, carminative, stomachic, antihistaminic, antibacterial. Used during influenza and onset of fever [juice of roasted lemon], hiccoughs, biliousness. The fruit contains betacarotene and cartenoid lycopene. Lycopene is especially noted for reducing the risk of prostate cancer. Fruit juice is used externally for ringworm [mixed with salt], erysipelas, also in the treatment of leprosy and white spots. By inhalation, grapefruit vapors are used to help the body retain water, for headache, stress, and depression. Grapefruit seed extract has also been nebulized for the treatment of lung infections. The fruit juice also contains coumarins and bioflavonoids. The acid content of the fruit, once digested, provides an alkaline effect within the body. The bioflavonoids strengthen the inner lining of blood vessels, especially veins and capillaries, and help counter varicose veins, arteriosclerosis, circulatory disorders and infections of liver, stomach and intestines. Topically, grapefruit oil is used for muscle fatigue, hair growth, toning the skin, and for acne and oily skin. Grapefruit seed extract is used topically as a facial cleanser, first-aid treatment, as a treatment for mild skin irritations, and as a vaginal douche for vaginal candidiasis [yeast infection]. It is also used as an ear or nasal rinse for preventing and treating infections; as a gargle for sore throats; and a dental rinse for preventing gingivitis, promoting healthy gums, and as a breath freshener. Breakfasting with fruit juice has long been seen as one of the healthiest ways to start the day, but Grapefruit juice and drug interactions are numerous. Researchers have warned that the fruit reacts with a large number of medicines causing devastating side-effects. Interactions may occur with commonly used drugs - such as those that lower cholesterol, treat high blood pressure, or fight cancer. So Grapefruit at medication time strictly no no. We Bengali follows the traditional proverb "Khali pete jol arr bhora pete phol" meaning one should start the day by drinking water in empty stomach and always take fruits after having full meal. Grapefruit interactions can be dangerous because blood levels of an interacting drug may rise, potentially leading to side effects. Drug levels rise because grapefruit compounds known as furanocoumarins can block cytochrome P450 3A4 [CYP3A4] enzymes. These enzymes, involved in the metabolism of over 50 percent of all drugs, are needed to break down drugs for elimination from the body. Some interactions are theoretical, based on their mechanism of action, but a warning is still important. It seems like taking the medication and the grapefruit or juice at different times might lessen the interaction, but this is not always true. The CYP450 enzymes, found in the intestine and the liver, can stay blocked after eating or drinking grapefruit - sometimes for more than 24 hours. Even drugs that are only given once a day cannot be separated from the grapefruit effect. If you need to avoid grapefruit while you are taking a certain drug, it is best not to consume grapefruit at all. Drinking grapefruit, apple and orange juice with an antihistamine called fexofenadine [Allegra] may lead to decreased levels of fexofenadine, meaning your antihistamine may not work as well. Take fexofenadine with water and avoid drinking large amounts of grapefruit, orange, or apple juice. One whole fruit or 200 milliliters of juice or less than one cup can block the CYP3A4 enzymes and lead to toxic blood levels of the drug. For example, when a common blood pressure medicine by the name of felodipine [Plendil] is taken with grapefruit juice instead of water blood levels of the drug can triple.